Perhaps fittingly, Harrogate Railway’s 2017/18 campaign ended with a frustrating defeat as the Starbeck club were edged out 1-0 by Worksop Town on Monday evening. 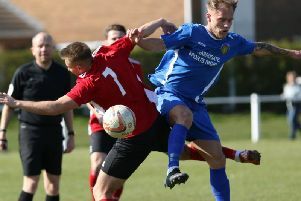 Marlon Adams’ side’s relegation from the NCEL Premier Division had already been confirmed prior to their final fixture of the season, and they were unable to sign off with a victory as a first-half penalty saw the Tigers grab all three points. The only goal of the game came in the 38th minute when Nathan Alexander was adjudged to have clipped the heels of Luke Black as he burst into the Railway box and Michael Trench stepped up to smash the resulting spot-kick high into the net. As has been the case on a number of occasions this season, the Railwaymen created plenty of opportunities in front of goal, but their inability to finish them off once again proved costly. Lewis Barnard twice teed-up Josh Underwood, but the striker was unable to add to his two recent goals, firing over the bar and then seeing a header land on top of the Worksop net. Visiting keeper Joshua Diggles made a fine save from Underwood’s fierce drive just before the interval then denied the same player again with another good stop early in the second half. Diggles also thwarted Barnard after the break, while Lincoln Adams’ header was cleared off the line and Railway ended the game empty-handed.